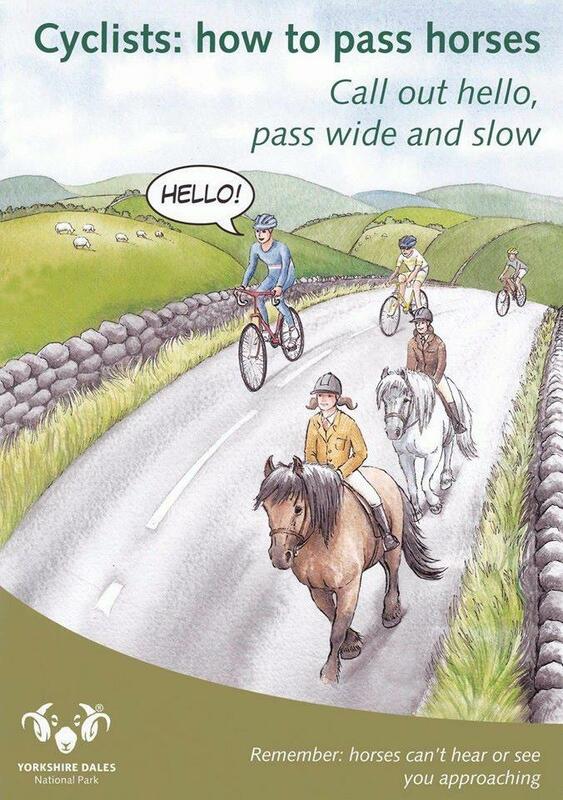 If you’re cycling on rural roads and lanes, you are likely to encounter horses. Follow this advice to ensure that both you and the horse riders can continue with a safe and enjoyable ride. The most important thing is to make the rider aware of your presence. If approaching from behind, horses have a very large blind spot and won’t see you until you’re practically level with their heads. It’s vital therefore to let the riders know you’re there with a clear “good morning” or similar. Don’t shout overly loudly but don’t be too tentative either. A horse is far less likely to be spooked by the sound of your voice than by being suddenly surprised by you appearing next to them. Wait until they’ve acknowledged your presence and follow any instructions they may give you for passing. Whether approaching horses from behind or head on, slow right down and be prepared to stop. This applies whether you’re out for a training ride or taking part in an event. Allow plenty of time and distance for the horse and rider to become aware of your presence. Don’t shift gears or brake hard when approaching horses as these sort of mechanical noises can easily spook them. Most horses being ridden on the road are used to passing traffic so, as long as you give them plenty of room and pass to the right as you normally would, they’ll be fine. Allow room in case they are surprised or startled, this is as much for your safety as it is for the horse and rider. If there isn’t space to pass safely, wait until a suitable opportunity arises, just as you’d hope a car would do the same for you. The more warning a horse rider has of you approaching, the better. Make sure you are visible and have suitable lights fitted to your bike, although avoid flashing front lights as these can scare horses. Keep an eye out for signs that there may be horses around. Fresh dung, bridleways that cross the road and nearby stables are all fairly clear indicators. Look out for horses being ridden two abreast as this can indicate a younger or nervous horse. Some riders will also wear tabards indicating a young or nervous horse or if they’re an inexperienced rider. Large groups of cyclists can be especially alarming for horses so, if you’re out on a club run or taking part in an event with other riders, be especially aware of this. Follow all the advice above, communicate through the group that you’re slowing down and split into groups of four or five riders to pass. The horse riders may be able to find a safe place, stop and let you pass as one group but you have to allow them the time to do this. It can be frustrating to have to slow down but always be polite and pleasant. We are all sharing the roads so we need to work with each other and respect other road users. Don’t take offence if a horse rider doesn’t appear to acknowledge your consideration, they are probably concentrating on controlling their horse. For further information take a look at the code of conduct for horse riders and cyclists from the British Horse Society. You also need to keep pedalling. The horses get a different kind of excited at the sound of a buzzing freewheel.